Developments in a number of countries worldwide show that the power of racist ideas remains strong, even forging movements and political parties that can result in deadly consequences. Various daily manifestations of racist hate speech and discrimination are a reminder of the persisting importance of this phenomenon as a social and political issue in the contemporary global environment, for racism remains a vibrant influence on current social and political movements, even on state policies. As one such timely example, the virulently anti-Semitic and racist Greek political party Golden Dawn combines both legal (running for elections) and illegal action (violently assaulting migrants) with a heavy nostalgia for the Third Reich. In Hungary, the Hungarian Guard, which is a paramilitary militia of the Jobbik party, terrorises the Roma people, even murdering some, forcing them to flee the country. A myriad of other examples could further be listed, which is why it is essential to develop a common culture of stigmatization of racism and promote a proactive role of community actors who can not only recognise and report these phenomena but also actively contrast racism, xenophobia, and related forms of intolerance throughout Europe. The LIGHT ON project addresses the dangerous underestimation of the progressive normalization of racist images and expressions in European Union (EU) societies. 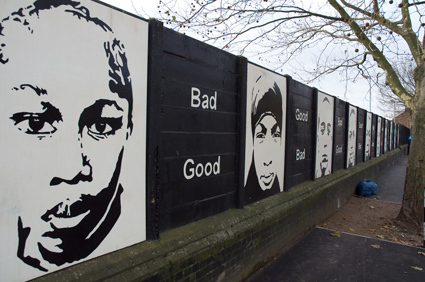 Pointing out the immense social disvalue and destabilizing effects of racism, however, the project aims at recognising racist manifestations, language and symbolism. As with other related phenomena, such as nationalism and xenophobia, racism – especially in its contemporary subtle forms – has a tendency to become normalized. The widespread trend of considering various xenophobic and racist manifestations in daily life (e.g. pictures, tattoos, slogans, speeches, videos, web contents) as a normal part of social relations gives cause for concern. Even more worryingly, media reporting has been shown to contribute to a perpetuated degrading and exclusion of minority groups, such as migrants or Roma people, because sensationalist media reporting tends to represent racist outbreaks of the majority population as a ‘normal’ reaction of the state and the people. Moreover, rather than revealing the social disvalue of racism, normalization is in direct relation to the frequently applied practice by the perpetrators of playing the part of the victims (in terms of ‘we are only defending ourselves and our rights’). A shared ‘nativist’ pan-European root of racism can therefore be discerned in various social and economic policies that put ‘our own people’ first – particularly in the current situation of the global social and economic crisis. Even though explicit and blatant forms of racial hatred and discrimination, such as physical violence still endure, a wider definition of racism enables us to understand and reveal more covert or subtle kinds of the phenomenon. These ‘newer’ forms of racism are so embedded in social processes and structures that they are even more difficult to explore and challenge. Neo-racism is a much more subtle form of racism, one which induces people to claim that they are not racist, and has been especially recognised in contemporary anti-immigrant attitudes, laws and policies. The concept of ‘race’ (associated with biology and ‘nature’) is in this way replaced by the concept of culture. Contemporary racism does not create differences based on biological aspects, but on the basis of alleged ‘insurmountable’ cultural differences, assuming the ‘danger of mixing’ and the ‘danger of elimination of boundaries’ between supposedly different cultures or civilizations, the incompatibility of lifestyles and traditions – building distinction, exclusion and intolerance based on difference. In all the five countries included in the LIGHT ON project (Finland, Hungary, Italy, Slovenia and the United Kingdom), the exclusionary racist logic perceives the supposed cultural characteristics of minority and immigrant communities as a ‘problem’ or ‘threat’ that represents something fundamentally different from the majority population. Finland, Italy and UK are countries with large immigration especially from Arab countries of Africa, Middle East and Asia. In Finland, street violence towards migrants from Somalia is higher than anywhere else in Europe. In all the three countries, the Muslim communities are the most vulnerable victims of racist prejudice and discrimination. Even though Hungary and Slovenia are currently not dealing with mass immigration, migrants have still been frequently used as a scapegoat and discriminated against. Moreover, across Europe the Roma people are by far the most frequent victims of racist discrimination, but also other communities, like the “southerners” of the former Yugoslav republics and Muslims in Slovenia, or Jews in Hungary. Ascribed religious and ethnic characteristics seem to additionally reinforce the inequality and discrimination of these communities in an intersectional manner. The economic crisis has in recent years fuelled the rise of various populist and radical right-wing groups e.g. the English Defense League and anti-EU and anti-immigration party Ukip (UK Independence Party), Forza nuova (New Force) and the anti-immigration party Lega Nord (North League) in Italy, the True Finns party in Finland, the Jobbik party in Hungary. Skewed media representations also fuel discriminatory attitudes towards minority groups, migrants and asylum seekers. Hate speech is far from limited to media and extremist groups, but features as part and parcel of political discourse. The link between racism and nationalism is obvious across Europe, where exclusionary ‘national interests’ are put to the fore, claims of ‘patriotic’ endeavours for the ‘homeland’ are made, and populist hate speech intersects with sexist, homophobic, racist and generally intolerant discourse. In addition to localised vilified scapegoats that are picked at in specific national contexts, across Europe racism remains primarily focused on migrants, Roma, Muslims, and Jews, who are constructed, discriminated against and persecuted as the undesired ‘outsiders’.